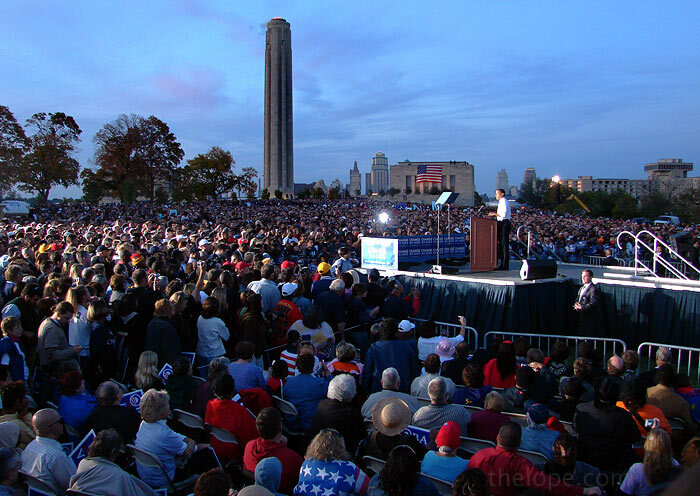 Presidential Candidate Barack Obama spoke to a crowd estimated by park and campaign officials at 75,000 at Liberty Memorial in Kansas City last night, October 18, 2008. 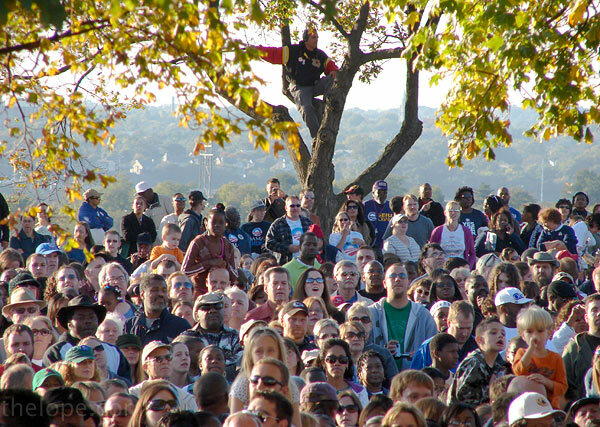 The memorial behind Obama houses the WWI Museum. 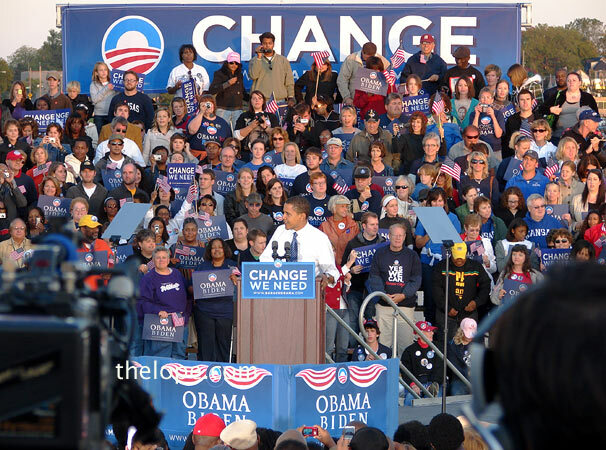 A couple hundred people were in the stands behind Obama. The rest covered virtually the entirety of the rather vast Liberty Memorial grounds. 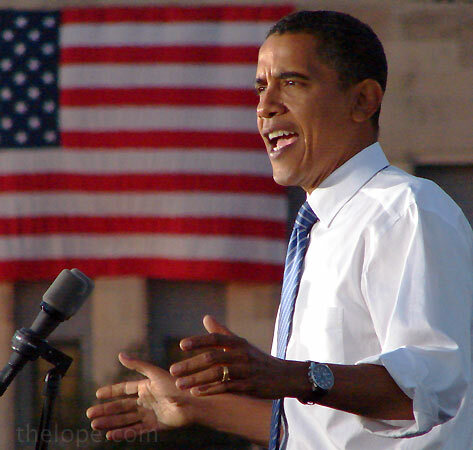 Obama was scheduled to speak at 6 PM; he was almost on time. 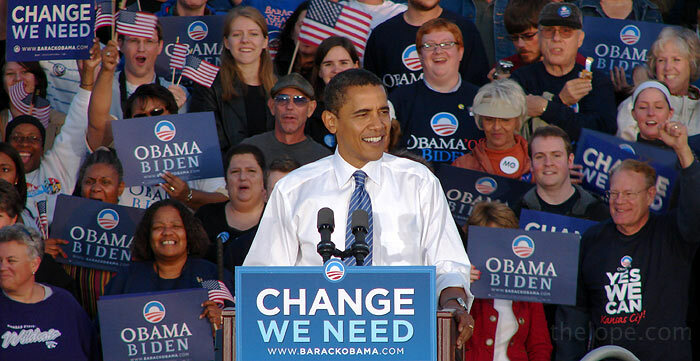 For the benefit of those planing their time around future Obama speeches in this tour, I'll note that he began speaking at 6:17 and ended at 6:49 - 32 minutes. 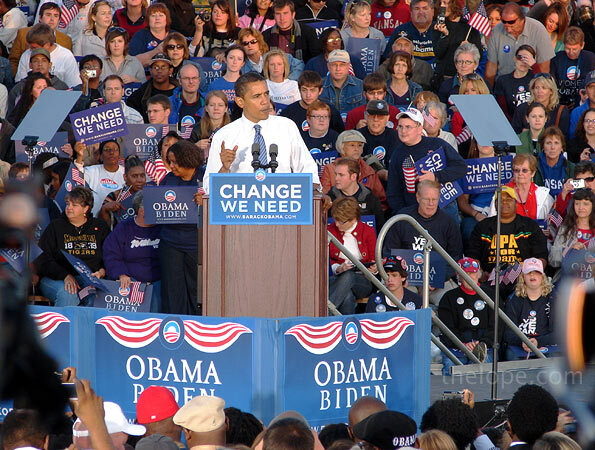 For a transcript of his speech, see myfoxkc.com. "Senator McCain wants to give the average Fortune 500 CEO a $700,000 tax cut but absolutely nothing at all to over 100 million Americans. 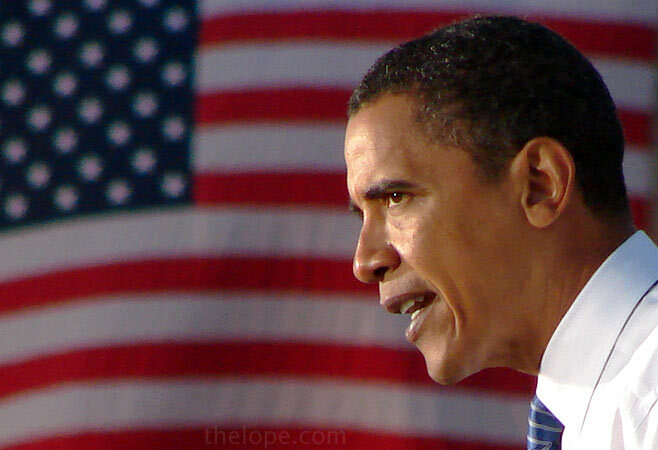 I want to cut taxes - cut taxes - for 95 percent of all workers. And under my plan, if you make less than $250,000 a year - which includes 98 percent of small business owners - you won't see your taxes increase one single dime. Not your payroll taxes, not your income taxes, not your capital gains taxes - nothing. 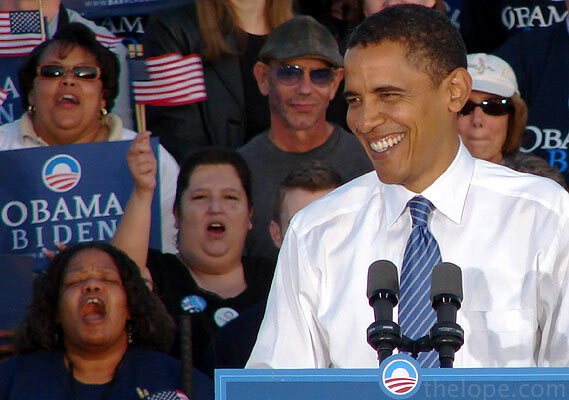 It's time to give the middle class a break, and that's what I'll do as President of the United States." 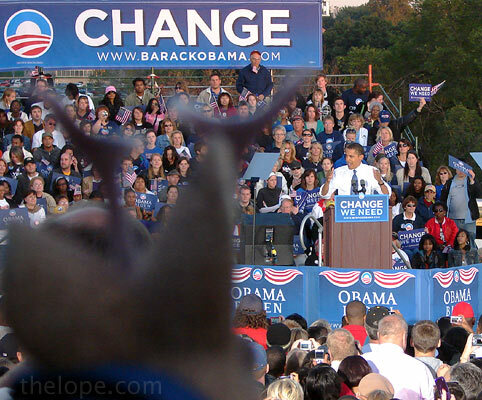 You may be wondering about the uniformity of the Obama Biden - Change We Need signs; they were given away at the rally. Attendees were asked beforehand via press releases not to bring their own signs. 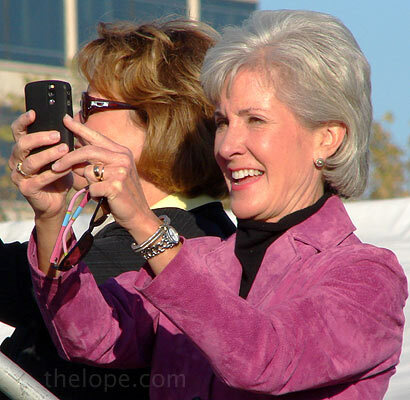 Before the rally began, Kansas Governor Kathleen Sebelius took a photo of the crowd with her phone. 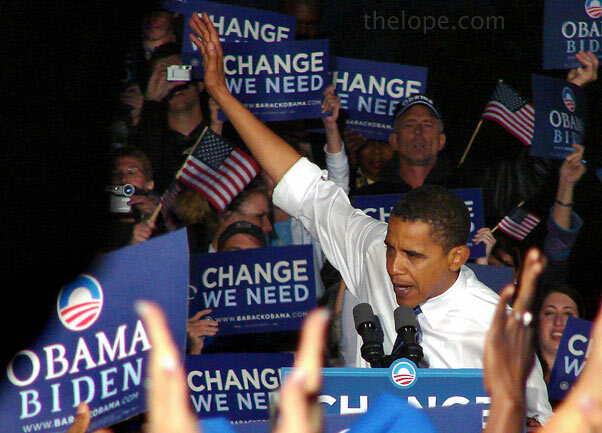 Amid a flourish of applause, Obama left the stage. He shook hands with a few in the crowd on his way back to his bus. 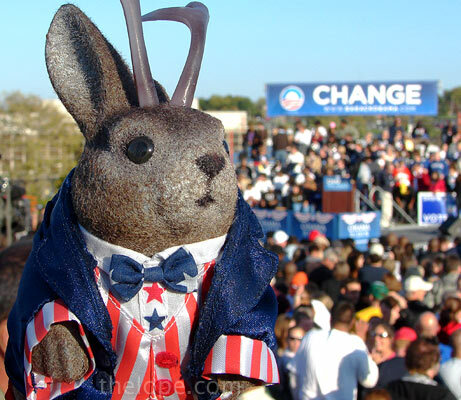 Ace Jackalope was in attendance to observe the ritual of the political rally. I couldn't resist shooting a couple short video clips. 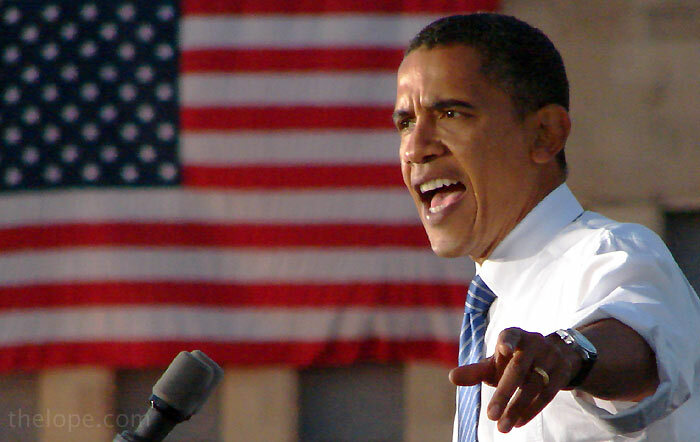 Obama takes the stage. There was a lot of echo from the PA system so I didn't continue the recording for long. He launched immediately into a series of thank yous. The Senator comments on the current financial crisis, the war in Iraq and the federal budget.